Sitting on a HUGE corner lot which is 10,332 SF with mature trees in the heart of Newport. This fabulous community is centrally located with tons of amenities for the entire family including private lake access, country club, swimming pool and parks! This home features beautiful vinyl plank flooring throughout the main living areas. Spacious family room with open concept to the kitchen and dining area; large breakfast bar with tons of cabinets and counter top space so the chef in your family will not be crowded! Split floor plan. Spacious master suite located in rear of home with private bath includes double sinks, tile shower and huge walk in closet. 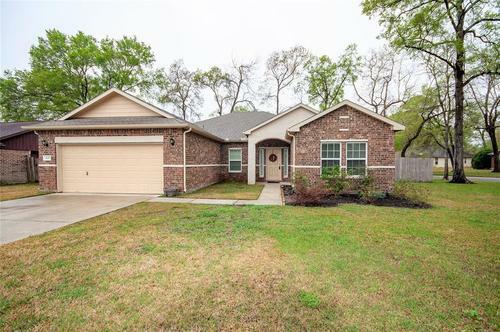 Two secondary bedrooms with jack and jill bath; study/flex room (or 4th bedroom if you need it); 1/2 bath off family room for guests; over sized covered back patio that you can enjoy year round. Two car garage with double driveway provides ample storage and parking for you and your guests.